Earlier this fall, in the heart of New York City's East Village, a mural of genre-defying Lil Peep (born Gustav Elijah Åhr) was unveiled. Created by Dame MSK and Elekkstasy from the Seventh Letter collective, the mural recreated a picture of Peep taken by Adam DeGross in celebration of his new album, Come Over When You're Sober Pt. 2. It was also hashtagged: #LilPeepForever. 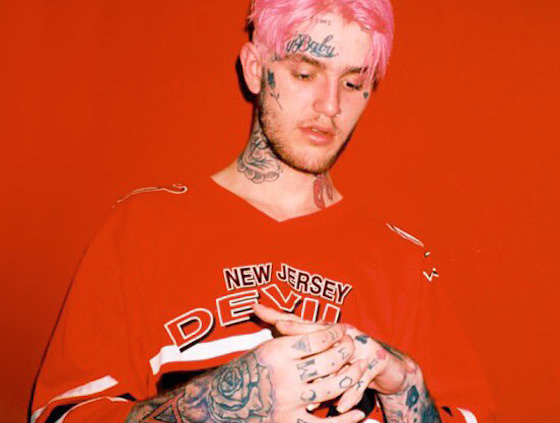 "This album is important because Gus is dead, but this is the album he would've made if he was living," Liza Womack, Lil Peep's mother, calmly said at an event in New York City, seated in a theatre-style venue filled with Peep's favourite things: Halloween decorations, candy and fans. Almost a year prior to the release of COWYS Pt. 2, Lil Peep, who openly struggled with depression and drug addiction, accidentally overdosed on a mixture of fentanyl and Xanax. Toxicology reports also revealed that there was also marijuana, cocaine, Tramadol and a number of other powerful prescription opiates in his system. "Gus told it like it was. We all like it when a person opens up about his or her pain — it makes us feel that we are not alone in our own sorrows. Gus's music made thousands of young people feel like [that] they had a friend who knew what they were going through, and they were correct," Womack continues. "Writing his songs, I believe, helped Gus to feel relief. Because of his honest words, many people Gus's age could relate to his music." As Womack expresses Peep's impact, she also raises a question: "What do you do when an artist dies long before his time, leaving behind a legacy of finished and unfinished work, and a legion of heartbroken fans?" Addressing both the issue of posthumous releases and the more-present opioid addiction creeping into the world of rap music, Womack acknowledges that these aren't new issues, but new issues for a social-media engaged generation. "Music artists suffer more than any other person. Music artists are judged and criticized all the time, yet they must tour constantly to promote their music [or] perform and never let their hurt feelings or raging bones show. They must keep their fans happy while appearing honestly psyched about performing every time, while they may [be] depressed, laying in bed and crying," she concedes.
" Past performers may have become addicted to alcohol or maybe experimented with heroin, acid or coke — Janis Joplin, Jimi Hendrix, Jim Morrison among others have died. Now, however, and particularly in the field of hip-hop, rap, emo-rap, trap… the young artists are using Xanax, Percocet and all that other stuff. Young music artists in this field are dying too often [and] the posthumous release of a young artist's music is a problem you will all have to face." While society agrees that no parent should ever have to bury their child, Womack is using her son's short legacy to educate a generation what to do with "the work of young artists who have left no explicit directions of how or what to do with their work if they die before they release it themselves. "Gus cared deeply about his music. He cared far more about the quality of his work than about making it big. His songs are almost dream-like at times, as they evoke events, conversations and feelings in a wide range of ways," Womack says encouragingly. While she has found her own way of healing, her mother's intuition — which was used to lead the direction of his posthumous album, has allowed Come Over When You're Sober Pt. 2 to bring healing to others. "This is the album that Gus would've wanted — and yes, I know what he wanted."